The Pelican Nebula is located in Cygnus right next to North America Nebula, and it is in fact the same cloud of glowing hydrogen gas. From our point of view the cloud is split in two forming the more photographed N-A nebula and the Pelican nebula by the dark dust between the Earth and the gas cloud. The dark dust has a lot of intricate detail I wanted to bring forward by increasing the local contrast using a contrast mapping algorithm. 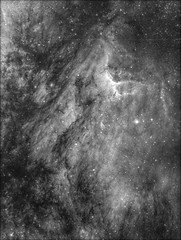 The Pelican nebula in Hydrogen alpha. Tone-mapped to show the rich low-contrast details, although the "pelicanness" is reduced a bit in the process.